Human Potentials Unlimited, Inc is an aggregator of companies involved in helping people to achieve their fullest potential. Businesses providing educational materials, courses, and other types of training fit our definition of "Human Potentials." If you're a business owner or executive, you need to know about Industry Aggregation. Whether you join or not, aggregation will dramatically affect your business. The Power of Aggregation is achieved through the merging of several like, similar or related businesses into a combined entity resulting in a whole that is greater than the sum of its parts. An aggregation becomes strategic when its members are aggregated around a marketing theme which facilitates exponential growth driven via cross-marketing and shared costs. Participation in an aggregation provides member companies with tremendous advantages over their non-aggregated competition. LEARN MORE ABOUT THE BENEFITS OF Industry Aggregation For You. The world has entered a period of economic turbulence caused in part by global hyper-competition, volatile energy costs, financial uncertainty, and waves of new technologies. This will most likely be a prolonged period during which the status quo will be upset by rapid changes in how business is conducted within your industry. The old business models and rules will be swept aside by new ones. Can your business weather the storm by itself? 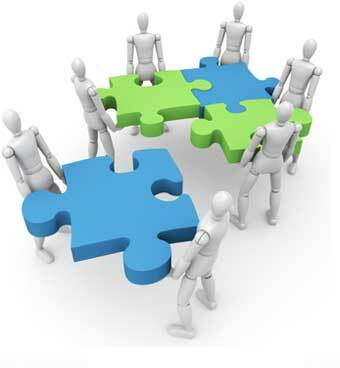 Or would it benefit from collaboration with successful partners committed to one another's success? 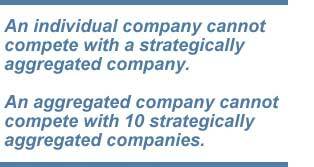 Consider the following to determine the answer to the question: Is Industry Aggregation right for YOUR company?